“For Your Consideration” Available to Watch Now! It is with great excitement and very thankful hearts that we present our supported employment short film, “For Your Consideration”, for your viewing pleasure. We are so proud of this project and of the initiative from which it was born. The Region 1 Department of Behavioral Health & Developmental Disabilities, along with the Quality Improvement Council and all Region 1 providers, came together to ask the question: How can we really create change regarding the employment of individuals with developmental disabilities? Will anyone listen to us? We weren’t exactly sure. But we thought they would listen to the individuals themselves. And, as a result, “For Your Consideration” transformed into a story, rather than a monologue. A compilation of lives and goals and passions, rather than just statistics. Our goal with this film is to reveal the true value in hiring individuals with developmental disabilities. We understand that the hesitation in doing so comes with the need for experience – for knowledge – and those things can only come from taking risks. Employers take risks every single day for the sake of business. And studies have shown that supported employees, on average, cost employers less money, have higher satisfaction and retention rates, and ultimately require less supervision than do traditional employees. So, truly, the benefit of hiring these individuals is far greater than it is anything else. Watch the whole video now and let us know what you think in the comments! And, today, we’re proud to announce the title of this short film: For Your Consideration. During brainstorming sessions over the title, we thought it would be a good idea to take advantage of commonly-used phrases in the hiring and job application processes. We wanted to convey a sense of need that could also be married with a sense of purpose. All individuals need to work and make an income. And all individuals look for purpose in their lives. It can come in many forms: family, friendships, faith, service, art, and, of course, work. So we’re here to help make that happen, not just as a provider of supports for individuals with developmental disabilities, but as people who genuinely care about our fellow men and want their lives to be enriched by opportunity. The truth is these individuals don’t need to believe they can achieve something. They know they can. And now it’s our turn to believe it, too. The film is currently in the editing stage and will be submitted for review next week. Be sure to follow us on Instagram and Twitter @GCRCOfficial, and also Like us on Facebook, to keep up with our agency and receive updates about the film’s release. A few of our team members will also be attending the Business Expo at Calhoun High School on October 22nd from 10 a.m.-2:00 p.m. where we’ll be handing out a limited number of free DVD copies, so stop by and see us! Ever since he was a little kid, Douglas has found solace in the outdoors. The warmth of the sunshine, the dirt under his fingernails, new life that sprouts up from beneath the ground. His mother had a garden and it was theirs together. Their place. Their home. Good stuff goes in, and good stuff comes out. When the opportunity came for a greenhouse to be built and a garden to be planted on the center property, Douglas helped make it happen. And now he oversees the care of every living thing. He weeds. He plants. He waters. He picks. He also sells. 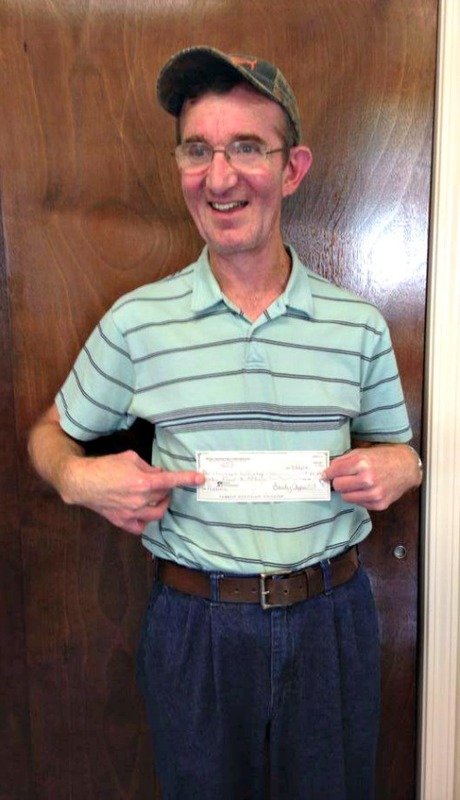 Earlier this summer, Douglas sold a mini-harvest of vegetables at a local wholesale market and earned a check that he proudly displayed to his friends and staff at the center. This is his job. But it’s more than that, too. It’s his life. And because of him, more life begins each day. This weekend, Saturday, August 23, we will be hosting our very first S.H.I.N.E. 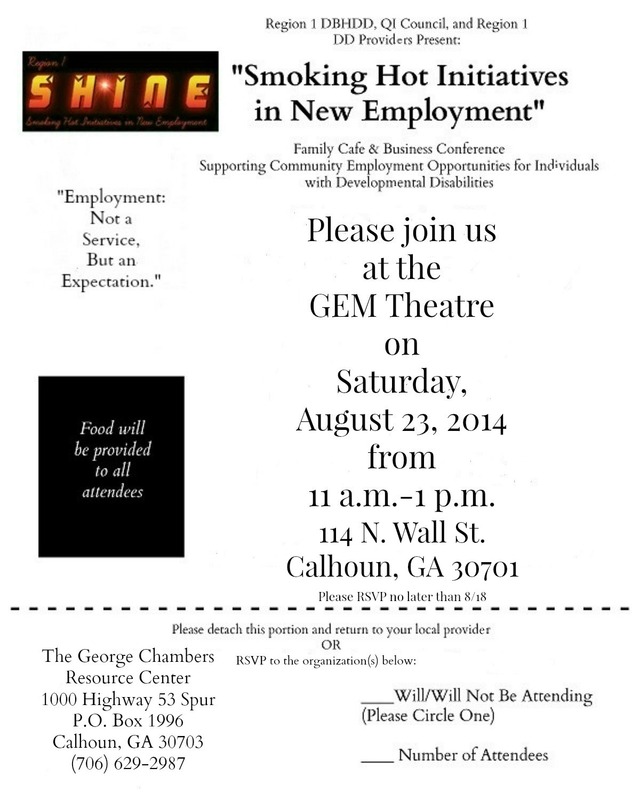 event at the historic GEM Theatre here in Calhoun. S.H.I.N.E. stands for “Smoking Hot Initiatives in New Employment” and, really, it’s all about getting local business owners together to talk about the potential we have, as a community, to change people’s lives. The individuals we serve have developmental disabilities. Some are high-functioning and others need more constant care. But they share one thing in common: they have dreams, hopes, and goals like every other person on this planet. So it should come as no surprise that many of these individuals are working to make their dreams become reality. Take Douglas, for example. He used to work in the garden with his mother, and those experiences cultivated a love for the earth, and for being outside, in his heart. 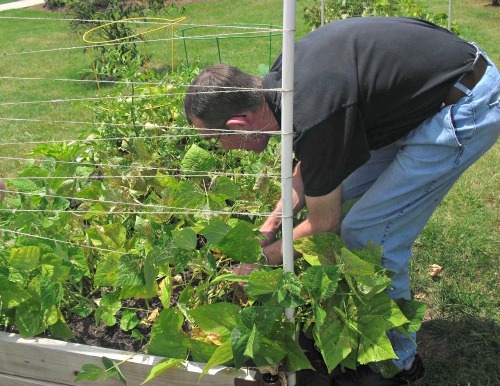 Douglas was a catalyst for building our own garden and greenhouse here at the center. And, thanks to some very generous community and business members who gave both their time and their money to see it happen, he is able to care for it and sell the vegetables at local markets. He is making connections with the community, building bridges, as we like to say, and the ripple effect from his small success has the potential to grow much, much wider. So here’s an important question to consider: Why do we work? For an income, that’s obvious. But, mostly, we pursue what we think will give us purpose. What we think will offer us a future. What we think we will enjoy. We take our skills, our passions, and our goals and we put them down on a resume, hoping an employer will take notice and choose us for the job. Douglas, and the many other individuals we serve, are no different. Well, now is your time to take notice. We hope you’ll join us at the S.H.I.N.E. event this weekend and learn more about how you can play a role in this exciting, and crucial, time for our community! Follow us on Twitter and Instagram @GCRCOfficial, and Like us on Facebook to keep up with all the news about this event and others. And, as always, you can send us an email if you have any questions or would like to RSVP for S.H.I.N.E. She is shy about sharing her drawings with the group, but there’s a pride that still shines through, despite her misgivings. She loves to sketch, to trace, and to color, but will everyone else love what she’s done? Will they laugh at her work? Or will they see what she sees? Beverly stands from her chair and holds up a sketch of a dinosaur, a triceratops. The colors are soft and shaded between the lines. She’s careful and precise with her work. All artists are with the things they love. A rounding chorus of “That’s pretty, Beverly!” “I like that!” and “I wish I could draw!” sound from around the room. 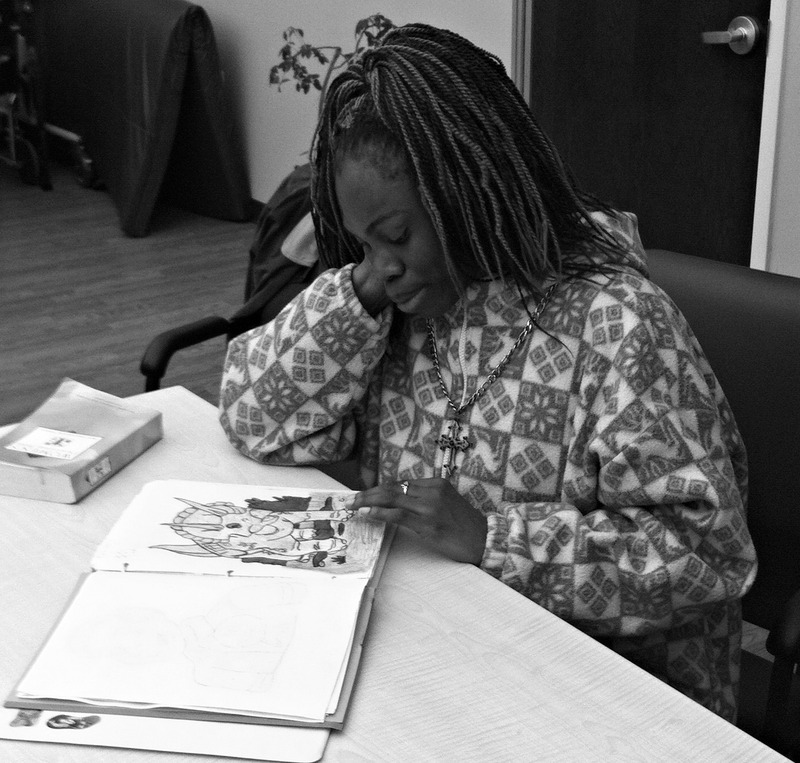 Beverly visibly relaxes in the wake of their interest and then pulls out a whole book of her drawings, eager to show off more of her favorites. She guides them through each page, telling a story with her words and with her pictures. As all good stories are. The pavement is hot and hard beneath his running shoes. His arm is starting to grow heavy from the weight of carrying the flame high above his head. But he keeps going. It’s his turn. 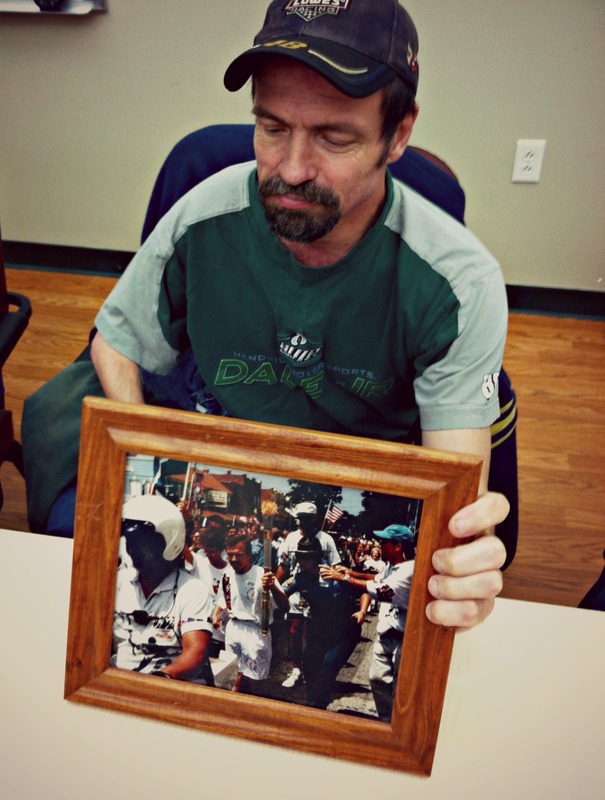 Danny Robinson holds a picture frame in his hands, a picture of himself from eighteen years ago, running through a crowd of people on a summer day in Georgia. It was 1996, the year of the Centennial Summer Olympics. The year Atlanta was selected to be the host of nations and athletes from across the globe. The year of The Magnificent Seven and 44 United States gold medals. Most of us remember that summer with pride and excitement. We can recall parades and marching bands and small town street parties celebrating the “Running of the Torch”. But no one lived it quite like the runners themselves…none quite like Danny. He shares the story of how he was selected to carry the torch with clear, articulate words. Every few moments, he grows shy. But his hesitation doesn’t last more than a few minutes. The memory of that run is as strong as it was nearly two decades ago, and his joy along with it. He hears the shouts and cheers of onlookers as he passes by, flame in hand. Cameras click and flash. The motorcade surrounding him rumbles, the smell of gasoline hanging like a curtain in the hot, humid air. But he barely notices. All he can think about is this moment, this opportunity, this day. He keeps running. “What was it like?” someone asks from the group.